(*) Or, a least, one of her family or entourage does. 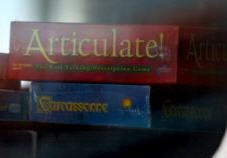 For their vacation, someone in the queen’s entourage packed some jigsaw puzzles and the board games Articulate! and Carcassonne, as discovered in a picture shot through the window. Go Queen.